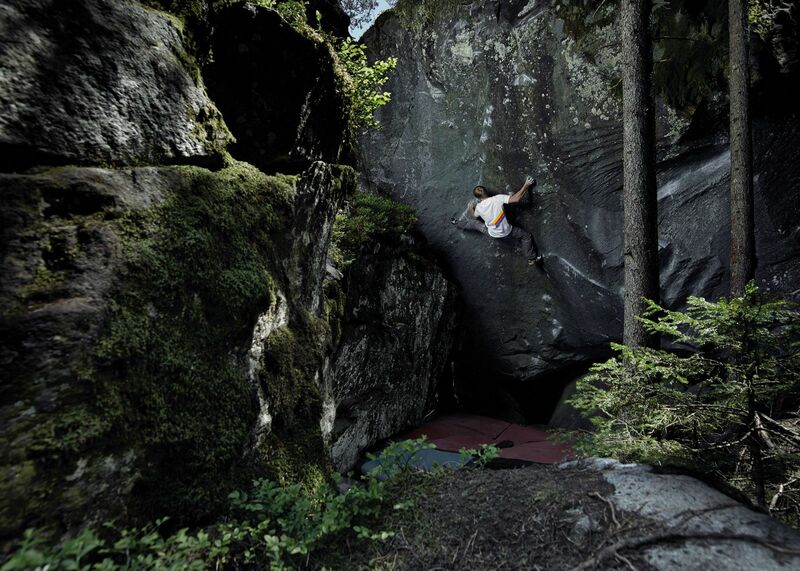 For seven years Nalle Hukkataival went back to Lappnor to try the same boulder, attempting to link up a succession of improbable moves. Throughout time, the puzzle, attempt after attempt, was slowly pieced together. The result is the first V17 boulder ever, climbed with a pair of Solution on his feet: Burden of Dreams. After seven years of attempts Nalle Hukkataival achieved in October of 2016 the first ascent of the most awaited for and probably most attempted boulder ever. Initially named Lappnor project, this overhanging boulder of granite, of 45° and approximately four metres high is situated in Finland. For the first time ever a grade of 9a (V17) was proposed. Still to this day it is the most difficult boulder problem ever climbed, Burden of dreams. I set off on my own from the climbing gym and while I was along the road it started to rain, things didn’t bode well. During that time of year at five pm it is pitch black. I was driving, and there was no rush, I reached the boulder and got ready, I had two lights and a video camera to set up. I got ready calmly, it was night time and the temperature was not going to change. When I was ready to start, I tried the finish once and it all went really well. I then took a long break and I tried to keep warm, without wasting energy, exactly how I had done before in the gym during my warm up, I only did the bare minimum to get myself ready and to keep my concentration. Afterwards I decided to try the first move, that meant giving it a proper attempt right from the beginning, starting from the ground. The aim was only to try the first moves, the ones on the lower part. I set off. I held the first edge with my right hand and I felt it the best I had ever felt it these past years, I was holding it perfectly. Perfect. It was there. While I held it, I felt something different compared to all the other times, something I had never felt before. It had only happened two or three times these past years, feeling this way. I really felt the right hand strong and powerful on that edge and the feeling was that everything was perfect. The hold was perfect. I was perfect. The entire world around me was perfect and clear. Perfectly in focus. It was a tremendous bout of energy, a spark which lit something inside me. So I decided to keep going on with the moves even for the intermediate section and I matched with my left hand trying to put my thumb on that edge, and right at that moment, I put a foot to the ground. It happened for a second, I still held the holds and kept on going, in any case it was a magic moment. It was crazy. And I came out on top of the boulder. I then got to the ground and I was happy and so excited, incredulous I went to see if the videocamera was working. It was the first time I managed to do all that, to climb the entire boulder with a sit down start, even putting my foot to the ground for a second it was nonetheless my best attempt ever. That fact, that conviction of being able to make it, what I felt during those moments really changed everything. «Burden of Dreams is one of those projects which is rare to find, placed on that fine line between possible and impossible. You don’t know if you will manage to climb it. There is a great difference between thinking that something is possible and knowing it is possible because you’ve almost made it. It is a matter of moving out of one world and entering the next dimension. It is no longer simply a matter of climbing, from then on. It is about you and what happens in your mind. It’s something else. Another level of perception». In all those years and during all those attempts I had never managed to climb this way before, therefore in any case that day I could consider myself incredibly satisfied for how things had gone. But I was certain that there was still something that had to happen. I had nothing to lose, all tension had disappeared and even if I had fallen on each single move on the successive attempts, well that would have been a special day nonetheless. I was therefore motivated and happy. I rested some more without any extra expectations, I was there in the woods on my own. After a bit I decided to give it another serious attempt. I felt good, lively. I set off and made the first move perfectly, the same way as before, same feeling. Impossible to do any better. I lifted my feet, lowered the left, opened up the right, placed both hands and I was back to the point in which I had fallen on the previous attempt. So I concentrated all my efforts to try and bring my left thumb above the edge’s rim and I controlled the barn door. That was already the highest point I had ever reached on that rock. Then from there on I don’t remember much of what happened. I continued climbing and it was from there that my brain just switched off. I woke up with my hands on the top and only after looking back at the video, I realised what had happened. I had climbed the first section, held the difficult edge, matched my hands, tackled all the other moves and I then reached the final border of the boulder to exit. And I held it. I must have tried the exit a million times, I was squeezing the edge and hung off it, on my own, in the dark without keeping my right foot on the hold. I tried to get back to the rock with my legs and leaning the tip of my Solution on the edge but I just could not keep myself against the rock. In all the attempts made during this season I realised that these things can happen. You try intense moves on those tiny edges and at that point your upper body is so tight due to the moves and the previous tension that it becomes a lot more difficult to swing your body backwards to go back to placing your right foot on the hold, the way you usually do. I had invented, in case I needed to use it, this way of coming off the boulder without using my feet, if by any chance I couldn’t manage to go back under with my legs. Therefore with a heel hook, I stretched beyond the edge looking for holds in the dark to exit and I come to the realisation that everything is about to end. A few more moves, I stand up, straighten up and in the end I am standing up on top of the boulder. That was the moment in which I woke up and I started to realise what had actually happened. I had made it. It isn’t that big show you see in movies. It is only another attempt, one extra one. There is nobody telling you: Hey, get ready because this is going to be the right attempt. It is only another attempt in a million, which will eventually work out. That is how it works, this is life and you are never quite ready for what happens in life. Maybe in movies or in climbing films everything appears epic, it’s as if someone has prepared it all and expects something extra, as if everything is necessarily special, but in the end it isn’t. At the end of the day even this is normality. It’s almost melancholic in the end. There are so many contrasting emotions and it’s as if you have imagined something different, you expected it to be special or that it would leave you something after all the effort you put into it, all the time you spent on it. You’ve put in so much effort, so many emotions and all you get back from it is one moment. As soon as you do it, it is already over. You wake up on top of the boulder and there is a mixture of feelings: surprise, relief and joy. Confusion. Disbelief. Then everything flows into a togetherness of ecstasy and alertness. Quiet. And the world no longer seems as it was.